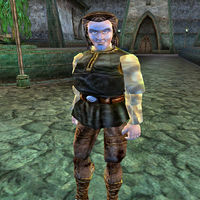 Thrud is a Nord barbarian who has been learning to read from Dilborn, but recently Dilborn has disappeared. The poor Nord asks for help in finding his lost friend and teacher. He wears a common shirt with matching pants and he carries an ebony war axe. Aside from his natural resistance to shock, immunity to frost, ability to shield himself, and a natural frost damage spell, he knows no spells. Although Thrud speaks in short sentences on quest-related topics (eg, "Thrud happy, Dilborn happy, ALL happy. "), if you ask him about anything else he speaks just like any other citizen. This page was last modified on 7 November 2013, at 19:13.